A phenomenon that has become increasingly common in the developed world and in Israel, in particular, is that of the working poor. Today in Israel, in the majority of poor households headed by a person of working age, that person is employed. Professor Haya Stier, Chair of the Taub Center’s Social Welfare Policy Program, undertook an in-depth study of this phenomenon. The study will appear in its entirety in the upcoming State of the Nation Report 2010. Poverty in Israel is defined by having a household income of less than half the national median household income, adjusted for family size. It is easy to see that families without any earners are very vulnerable to poverty, unless they have significant sources of income other than from work. Government assistance programs are not generally designed to keep recipients out of poverty but rather to guarantee a very basic level of subsistence or to supplement families with low income from work. 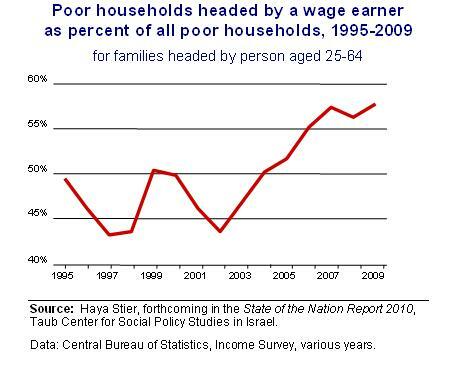 But families with wage earners can also find themselves below the poverty line. This will happen if earnings are low, or if there are many household members. In terms of net incomes – that is, after taxes and welfare payments – Israel has a very high poverty rate, among the highest in the developed world, and poverty rates have risen considerably since the beginning of the decade. The proportion of poor families headed by an employed person (among those headed by a person between the ages of 25 and 64) has also risen considerably, so that overall, the number of working poor has seen a particularly sharp rise. The first figure shows the total portion of poor households headed by a person at work. In Israel today, the majority of poor families in this age group fall into this category. One reason for this trend is the deliberate government policy of encouraging poor people to work rather than to live off of public assistance. The objective of this policy was to help people escape poverty, but so far one effect has been to move many families from the idle poor to the working poor, without much change in their standard of living. It is likely that the inducements to work involved too much “stick” (reduction of benefits) and too little “carrot” (improving the compensation from the return to work) and as a result, the program may have saved money for the Treasury but has not made a major impact on poverty levels. 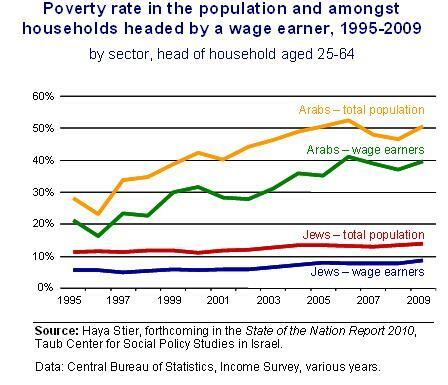 Using disaggregated data, Stier discovered that the rise in the working poor has been to a large extent concentrated among Arab Israelis. The second figure shows that among Jewish Israelis, the proportion of working poor is considerably lower, and virtually unchanged. But among Arab Israelis, the share of poor rose since 1995 from about 20 percent to about 40 percent. Low labor force participation rates for women. In those Arab households where the woman is employed, poverty rates are actually quite low. Thus, the gap in working poor between Jewish and Arab Israelis is due in large measure to the low proportion of two-earner couples among Arab Israelis. Demographic differences. As a whole, the Arab population is younger and a larger proportion of household heads in this community are younger. Forty-two percent of Arab household heads are under 35 years old and thus before their peak earning years, compared to only thirty three percent of Jewish household heads. Furthermore, the Arab families have more children on average, and for a given household income, households with more children are poorer. Loss of child allowances. Since Arab households with a working head of household tend to have more children than comparable Jewish households, the marked decline in child allowances in recent years has had a disproportionate impact on Arab Israeli working poor. The complete findings of Professor Stier also include a detailed study of poverty in families with a working single-parent. Her study will be published in full in the Taub Center State of the Nation Report 2010.